I’ve been struggling with my entrepreneurial spirit. A loss of focus, and clarity on my next steps to grow my business have given me time to pause, and allow myself to get caught up in working in my business and not on it. (Therefore, I’ve neglected my blog of late.) I am an accidental entrepreneur – I love the business I’m in and never dreamt I’d start my own. So I’m figuring out how to run and grow the business as I progress. Yes, I have a business plan. I update it every year. Yes, I have a vision for my business. I know exactly where I want to be and what I want it to look like. Join me here, as I vow to change some habits and create an action plan that will push the boulder out of it’s comfy spot in the groove it’s carved for itself. Please add some ideas in the comments section and lets do this together. Wake up earlier: one hour. I’ll admit I tried to start doing this this morning and it didn’t work. Ok, we’ll ease into this one. Maybe tomorrow. With this extra hour, I will do something proactive, creative – not just open my email and work on whittling down the inbox. It might be to blog, or to pursue a new opportunity. Thing bigger: I’ve been told: You’re not thinking big enough. Did this hit a nerve with you when you read it? I realized that I am a big part of the problem. Limiting beliefs are holding me back. Self-confidence, Man! Pull yourself together. Surround yourself with brilliance – I truly believe it rubs off and raises your own bar. I just spent the weekend with colleagues I respect, admire and love – we are in the same business and rather than be competitive, we’ve shared best practices, our own challenges, and sought ways to work together. We also inspire and motivate each other. Get yourself one of these groups. Make time to work on the business: I will identify about 20% of my time, and block it out to work on my business. No email, phone calls or meetings. This is where the real difference starts happening. If I’m just doing my day to day tactical work, every single day, where does the growth occur? how do I move forward? I will blog more (you can cheer here if you want), I will write more articles, I will find speaking engagements. I will share my expertise with others. I will engage more online and in person. I will expand my geographic footprint. Balance life: I preach about this constantly. For me, exercise is my outlet – trail running, mountain biking, yoga, cross country skiing. It may be some other activity for you. I schedule it right into my week. It’s in my calendar as an appointment. If someone wants to schedule a meeting, that particular slot is not available. It is just as important as a new or existing client meeting and is critical to my rested, happy, creative and productive self. Therefore, it is important to my clients – whether they realize it or not. I don’t have to work on rule #5. I’ve got it down. Audit my time: Wow, this could be huge. I’m taking a close look at how my time is spent. What tasks am I doing that can be performed by someone at a much lower rate, freeing me up to do the tasks with far greater return? If I can delegate some of my tactical work to someone who costs less than I do, how many more hours can I bill, or widgets can I sell because I’m focusing on tasks that allow me to do so? No more excuses: What excuses, rationalizations, justifications are you making for yourself? Eliminate them. You don’t have time? eliminate that problem. See Rule #6. Here’s mine – I live in a small rural market, it takes longer to grow a business. I don’t have the access others do. Wrong, not in today’s globalized economy. I’m kidding myself. What’s yours? What are some other things we can all do to push our careers and our businesses to the next level? Lisa this is wonderful self-awareness — the very first step in my version of the three “A”‘s — awareness, acceptance and action. I’ve learned and coached people that before you can get to action (e.g. really doing what it takes to grow your business), you need to truly accept what you are now aware of. I’ve found that acceptance is more difficult than awareness. The addict may be aware he has a problem but only after he accepts that the problem is killing him or destroying his family can he move to action. Your ideas for changing your habits, making time for working on the business are all good. I hope you have also truly accepted the need for change. Talk about coincidence. I was actively cogitating over these very topics last week. In fact, I think everyone of us in this business reviews these issues periodically, but it’s the smaller of us that need the reminder that doing everything will never allow you to have it all. Bob, it’s a constant review, isn’t it? Sometimes I feel like I carry a bushel of apples. As soon as I think I’m busy enough to add help, one of the apples falls out of the basket. By the way, when Iisted names of those that inspire me, I knew I was going to leave someone out. That would be you. I’m honored to be part of your support group & appreciate that you do the same for me! I’m really trying to get back to running. Eric Morgenstern just told me that he also schedules fitness time on his calendar. I need to try it. Great post, Lisa, and an excellent plan! For many years my hubby has had a sign over his desk that says “Is what you’re doing right now the most important thing?”. Early on when I asked him about it, he said it helped him stay focused on doing what was necessary to grow the business (which at that time was a call center in the travel industry that we were building and later sold). I liked that sign so much that I made a hand-made copy to hang over my desk. For me what it meant was, “am I working on something that will bring in income?” Or at times, “is what I’m doing helping our business to grow?”….sometimes the answer was no, so I had to refocus myself. While I love your blog, it should definitely be lowest on your list of priorities…I know a number of bloggers who do a once-a-month post, more like the monthly “letter from the editor” that you see in magazines, sort of a ‘what’s happening’ in their industry and at their magazine – you could do something similar and not put pressure on yourself to write more frequently. I love this and can’t wait to hold you accountable to it! 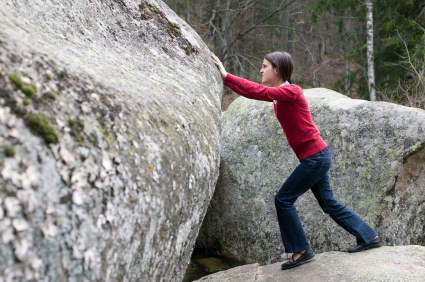 I’m so proud of you for putting it out there and really thinking about how you’re going to move the boulder. I also schedule my exercise time (and we all know I get it in) and I block Fridays to work SOLELY on the business. Perhaps that’s your 20%? When I started doing that a few months ago, the business really began to pick up and move more quickly toward the vision. I won’t take client meetings, calls, or do any client work on Fridays. That’s just how it is and it’s never been a problem for anyone.